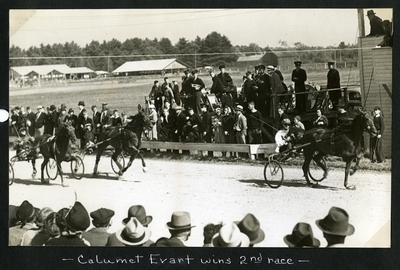 Black and white photograph of chestnut gelding, trotter Calumet Evart wearing head number six, Day up winning the first heat of the 2.16 Trot at the 1938 Cumberland Fair in West Cumberland, Maine, Thursday, September 22, 1938. Bay gelding, O. C. McGregor wearing head number two, Haddock up, placed in second place. Chestnut gelding, Calumet Euclid, Chappelle up, showed in third.